The creator of Carleton Clothing uses his brand and designs to speak out about local environmental issues. Reid Carleton, a local artist on Long Island, takes his designs and brand to support Long Island advocacy groups through collaborating on artwork and selling them on shirts and other merchandise within his community through his company. “Usually the design determines which direction I am going to go in. I have pieces of ideas in my head. Half of an idea that I like but its missing something,” said Carleton, 37, the owner and creator of Carleton Clothing. “Sometimes that missing piece is found by teaming up with an organization. The organization must fit with the design and I do a little research on them as well. If I think it is a good fit, I reach out.” Usually, Carleton will come up with a design or idea on his own and present it to companies and organizations, but sometimes companies will reach out and offer to pay him to come up with a design. Activism and working with advocacy groups had not always been something that Carleton spent his time doing before having his brand as a platform. He received his art education from the School of Visual Arts, NYC, and came up with the fishbone design in 2005, making shirts and stickers only for his family and friends. By 2010, Carleton had officially incorporated and starting selling his designs through his very own brand, Carleton Clothing. From 2010 to 2014, he had a full-time job as a graphic artist at MV Sport and was running the business out of the basement of a house he shared with his brothers in Bellport. “I was printing and delivering on weekends and after work, mailing out online orders during my lunch break,” Carleton said. In 2014 he quit his job and went full time with his business. Today, running Carleton Clothing remains his full-time job. His products can be found on the Carleton Clothing website and in stores across the island, including TOLA., Bunger and Flying Point. 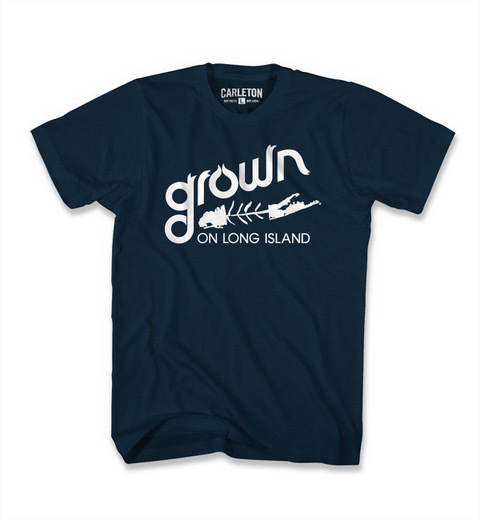 Carleton has used his designs to collaborate with the Long Island Farm Bureau and wanted to take an interesting spin on their pre-existing “Grown on Long Island” logo. “Growing up, my family would always stop at this one farm stand on the way to the beach. They had a ‘Grown on Long Island’ sign and it always stuck with me. Being able to work with the LIFB and have my logo associated with that iconic phrase means a lot me,” Carleton said. When he wanted to combine his logo with LIFB’s, Carleton reached out to the organization to see if they were interested in the partnership. Robert Carpenter, the administrative director at LIFB, worked with Carleton personally to make the collaboration become a reality. Carleton does not only use his brand to help his community and get involved in design projects. 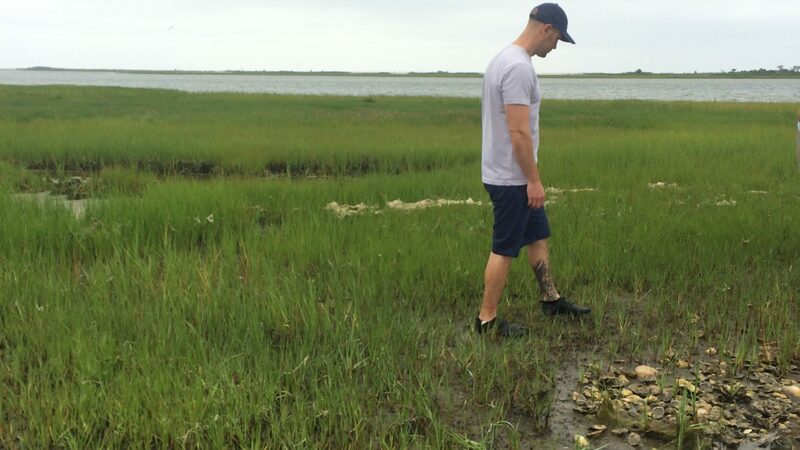 He has also participated in numerous Great South Bay cleanups in Bellport with a local paddle boarding company, Get Up Stand Up (GUSU). Meaghan Shannon, the owner of GUSU, said that Carleton “comes pretty regularly” to their cleanups. “He’s always on board to help. He was on board for the first clean up we did, and he’s always played a big part in the community; it’s his own personality,” said Shannon. Other projects that Carleton has created designs for include artwork for Blue Point Brewing Company’s “Drink The Bay Clean” cans, and the creation of the “protect the inlet” phrase and artwork. He came up with the phrase in response to the Army Corps of Engineers’ idea of filling the Old Inlet that broke into the New Inlet after Hurricane Sandy. The project would have cost an estimated $8 to 9 million, according to Carleton, and he was not in support of that. However, the inlet wound up closing on its own. “It just seemed like a money grab and a waste of money to fill in,” Carleton said. Carleton had worked on the “protect the inlet” design and concept independent from an advocacy group or organization because he wanted to take the opportunity to speak out about an issue on his own. “Being a resident of Brookhaven / Bellport, it was and is clear the New inlet had a positive effect on the bay,” Carleton said. “I wanted to voice my opinion and made a few stickers, hats and tees. 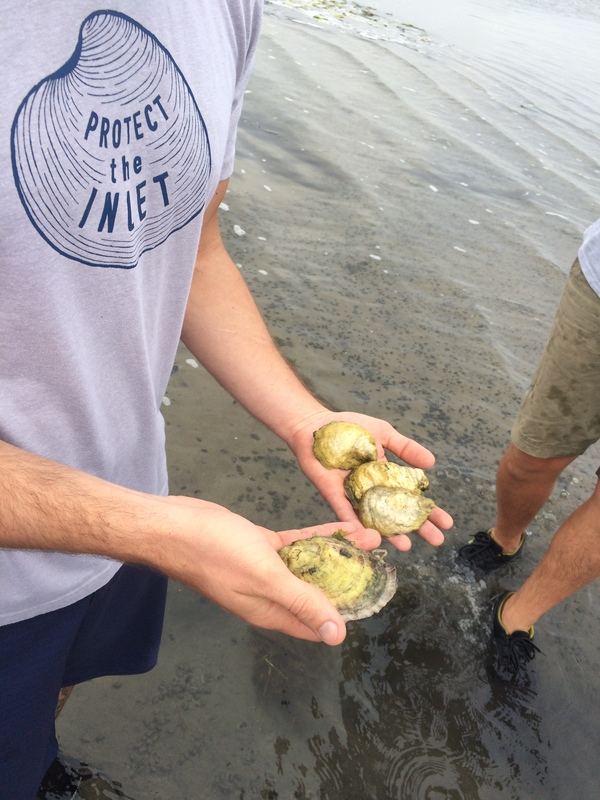 I didn’t team up with any organization for that project but after sales were made with the Protect the Inlet design, I started making regular donations, that balanced out with the sales, to the Peconic Bay Keeper.” Carleton said he chose Peconic Bay Keeper because at the time, in 2012, it was one of only a few “reputable” organizations available.